Mummy makes cakes | A Cheshire mummy with a boy and a girl. A blog of the fun things we do and the places we go. Oh and baking. Lots of baking. I have to admit that I don’t really believe in Christmas starting before December, the Christmas aisles springing up before Halloween is over and done with annoy me and I have an annual grumble about it. 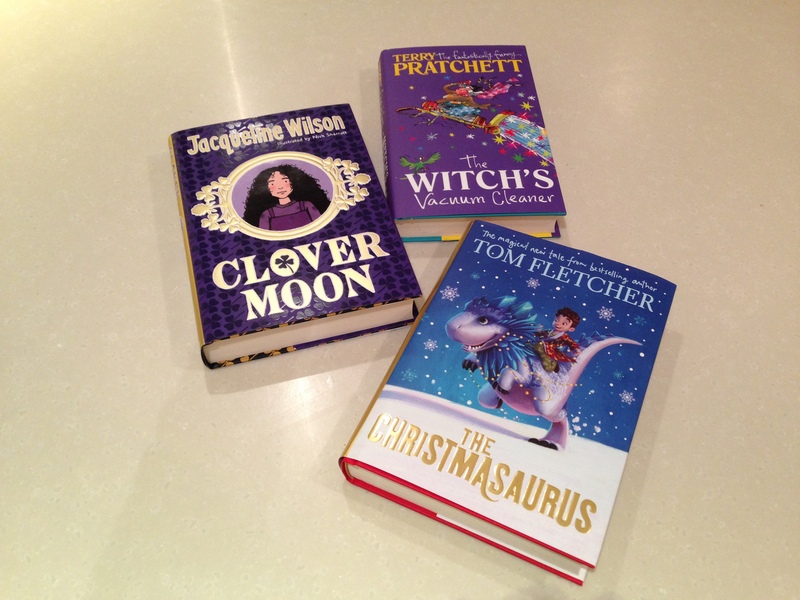 However, on Friday it will be December, our (multiple) advent calendars will get started (Lego, MLP, traditional etc.) 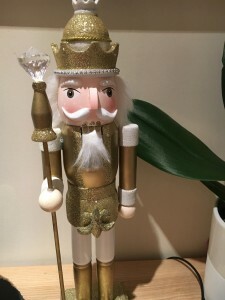 so when I saw a nutcracker this week I broke my no early decorations rule and bought him. 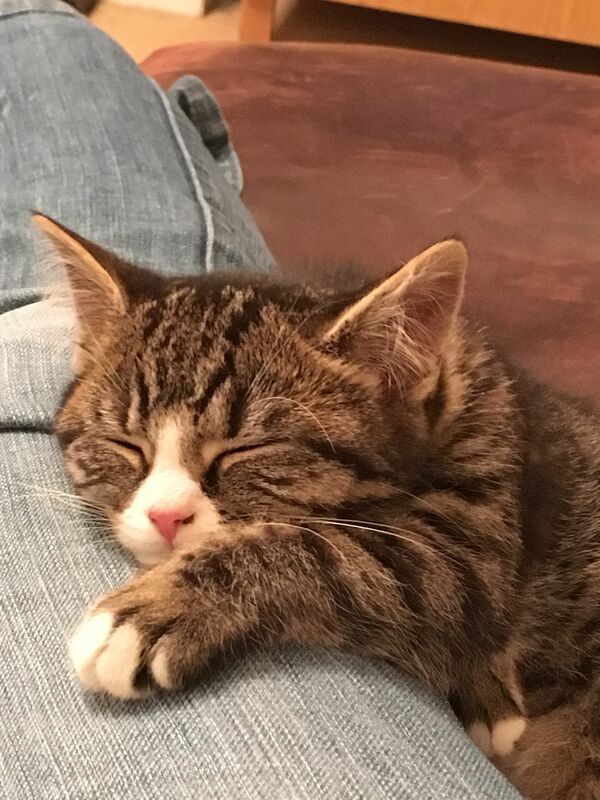 He was only £7 and I thought a bit of a bargain. 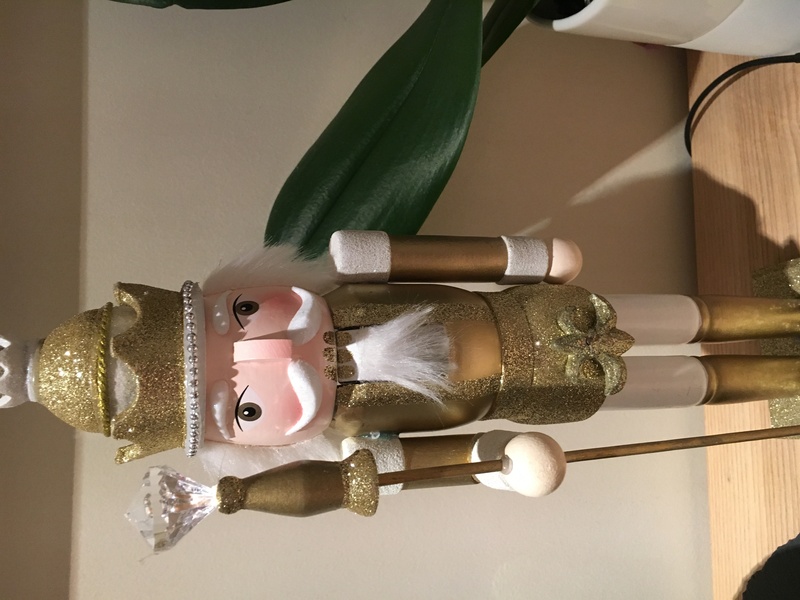 Since I couldn’t face finding the decorations box to put him away he now has pride of place in my dining room. 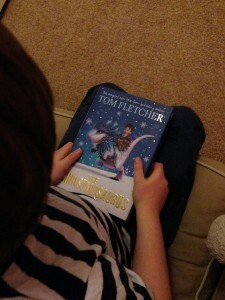 This entry was posted in Sponsored and tagged Christmas, freebies, gifts, sponsored. I love cake (you might have noticed), but I also like to stay healthy and have a day job in public health. I enjoy yoga, go to dance classes when I can and generally try to have a fairly balanced diet. There are lots of ways to monitor your health but one of the easiest and quickest health checks you can do is for cholesterol levels in your blood. According to the British Heart Foundation around 7 million people in the UK are living with heart and circulatory disease, there have been several government campaigns about healthy eating in the last few years and all sorts of adverts talk about people’s cholesterol levels – the ones that stick in my mind most are the margarine ones because one of the best ways to enjoy baking and reduce your cholesterol intake is to swap butter in recipes for a low cholesterol margarine. This week I received a free home cholesterol testing kit available from Push Doctor and was happy to find out that my cholesterol levels are low enough to give me a green smiley face (150mg/dl if you want the technical level). The colour doesn’t show up well in the photo but it was a definite pale green. It’s reassuring to know that I’m keeping healthy in spite of my baking addiction. If you would like to order your own free kit go to Push Doctor and fill out the form. 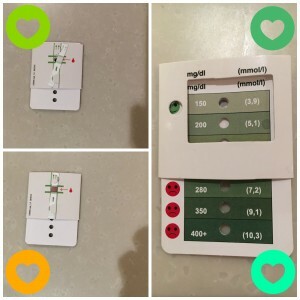 The test itself is really easy, align the test strip in the holder – be brave for a millisecond while you touch your fingertip with the sterile lancet (if I can do it anyone can – I hate needles with a passion), then put the drop of blood on the test strip and turn over. The little hole can be matched to the colour chart on the other side and the emoji shows how good or bad your cholesterol levels are. 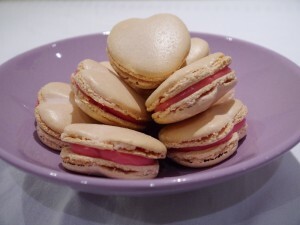 Of course if you want to limit cholesterol in a recipe even more then you could always try one with no butter or margarine like my heart shaped macrons – you might need to miss out the filling though! 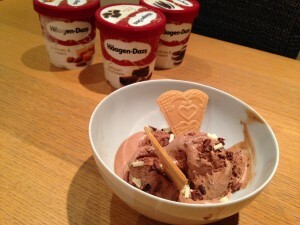 This entry was posted in Sponsored and tagged cholesterol, heart health, public health, push doctor, sponsored. 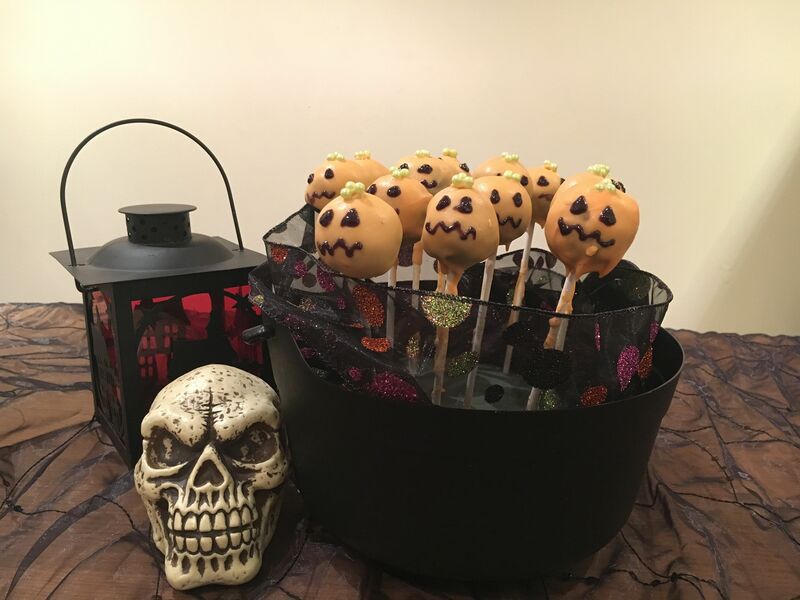 Last week I made a graveyard ghost cake for Halloween, I leveled the top of the cake and had left over buttercream icing so decided to use the leftover cake and icing to make cake pops. These pumpkin cake pops are actually chocolate cake inside. I blended the left over cake, added the icing and mixed to a thick paste. rolled into balls and pushed sticks into them, then set them in the fridge for an hour. 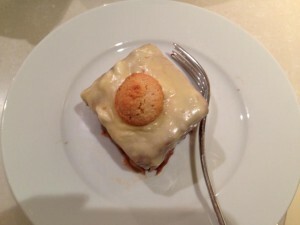 Next I melted some white chocolate and added some orange gel colouring (not liquid). I dipped the chilled cake pops into the chocolate and added green sugar pearls onto the top before standing them up to set. I used a cake pop stand but a mug also works. Once set I added faces with ready made black writing icing. This entry was posted in Spooktacular Halloween Ideas. This year my son had two birthday cakes, one for his party and one on his actual birthday – the on the day cake was the easiest he’s ever asked for, “a diamond block from Minecraft, Mummy – so, you know, a blue block”. 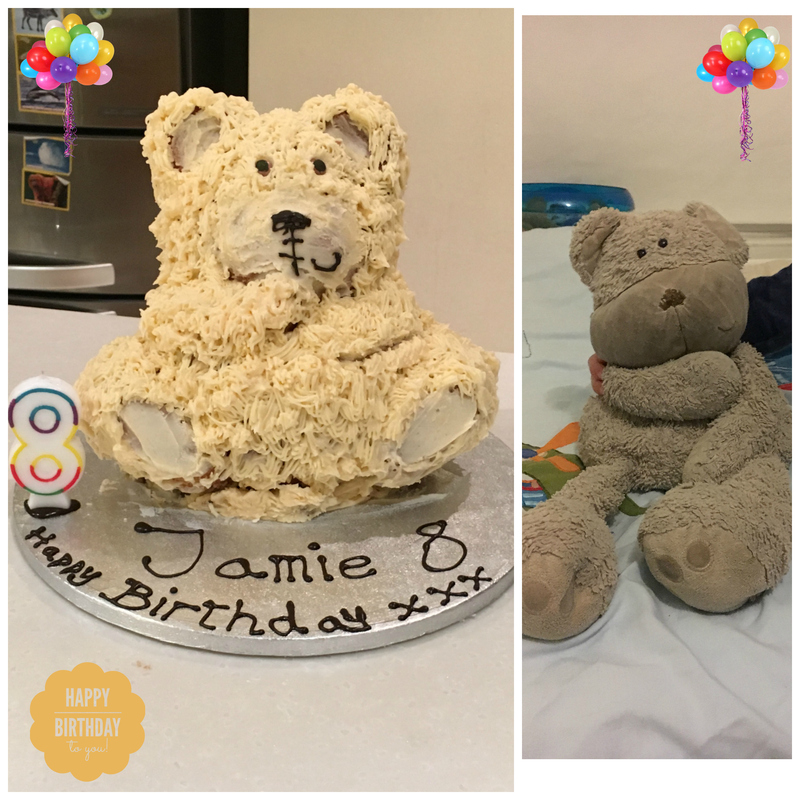 I think he was lulling me into a false sense of security though because his next request was a party cake that looked exactly like Crumble (his very well loved and grotty bear). Luckily for me there are a few 3d cake tins around which made my life easier – you can find a good range at The craft company. In the end I found a Wilton 3D Teddy Bear Tin on Amazon which looked close enough to his bear and saved me a lot of drama with hemisphere tins and a bread knife. Making the cake involved removing all the shelves from my oven and baking the bear upside down, nerve wracking but successful. The tin was a Wilton one and I ended up using an 8 egg mix to fill it. I started with 6 but ended up making more batter as I didn’t have quite enough to fill the metal core which helps the cake cook evenly throughout. I used a grass style piping nozzle to create Crumble’s fur and dark brown coloured water icing for his nose and mouth. The eyes were brown smarties with the pupils added using a black food colouring pen. The instructions suggest putting grease-proof paper around the join, I skipped this step and the cake did work but with some leakage so probably worth doing. Thoroughly grease the tin and dust with flour. 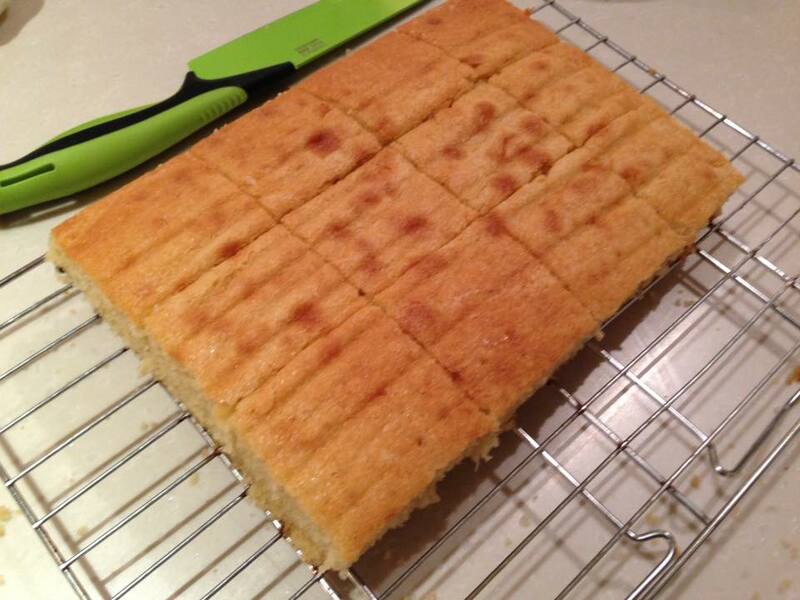 The flour helps to stop the cake sticking and also shows up any spots you’ve missed while greasing the tins. Remember to grease and flour both sides of the metal core if you are filling it with batter. Loosen both sides of the tin once the cake is baked but replace and leave to cool in the tin to protect the cake while it’s at it’s most delicate. 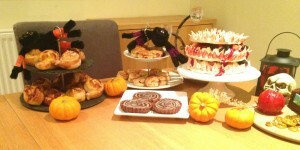 This entry was posted in Large cakes and tagged cake, crumble, mamas and papas, once upon a time, teddy bear, Wilton. Halloween and the final of the great british bake off all within one week of each other doesn’t happen all that often, but last year it did, so it felt like it would be rude not to combine the two. 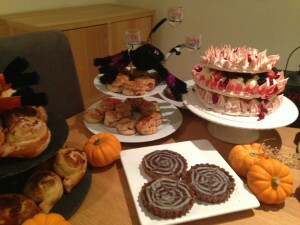 The final of GBBO last year was royal themed, with pavlova crowns, Victoria sponges and picnic tea fit for a queen. The most halloween appropriate queen I could think of was the Evil Queen from snow white and the seven dwarfs, both the disney version and the american series Once Upon a Time, which I really really like. I decided to combine the picnic tea and pavlova signature bake into an afternoon tea she would appreciate, (I’m not sure she actually “loves” anything except that mirror of hers). 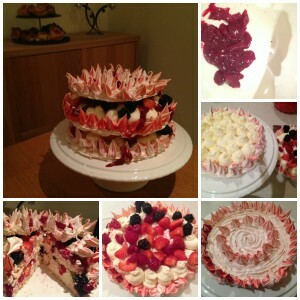 Including the pavlova style meringue crown was perfect as it’s my favourite dessert which I usually only make at Christmas. I thought a crown with lots of teeth dripping with blood would be her kind of thing so I made an italian meringue (80g of egg white to 215g castor sugar, heated with a little water to 113.5c) which holds it’s shape when piped and then baked it in the oven at 150c to crisp it up. It was made of two 9 inch discs and a smaller top to make the crown. Whipped cream, blackberries, raspberries and strawberries made the filling along with a thick raspberry “jelly” (according to Mary Berry this week it isn’t jam if the seeds are sieved out), made with less sugar than traditional jam to keep it tart enough to offset the sweet meringue. 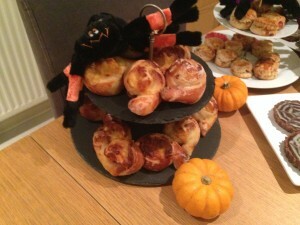 The rest of my afternoon tea had to adapted slightly to appeal to the majority of my audience – i.e. a five year old and a seven year old, so instead of savoury scones and sausage rolls we had baked ham and cheese bread rolls shaped like snails and cherry scones, baked chocolate custard tarts with white chocolate custard spider web decorations, a ganache covered chocolate cake shaped like the Evil Queen’s box for Snow White’s heart and candy apples (not poisonous). The snail buns are made by rolling out the bread dough between the first and 2nd prove and filling with parma ham and grated mozzarella cheese in a similar method to my savoury corone. The dough is then rolled up into a spiral and cut into sections, the last part of the roll makes the snails heads and the rolls are stood on a greased and floured baking tray for their 2nd prove before baking. The chocolate tarts are mini versions of the chocolate tart I made last year – the same recipie made seven small tarts. The candy apples are made by heating castor sugar, red food colouring and a little water to 150c (the hard crack stage) and pouring over the apples – if they are on sticks you get better coverage by dipping the apples into the sugar syrup. Finally the chocolate cake recipe is an adaptation of an easy sponge cake with some flower paste decorations. An easy chocolate cake covered in dark chocolate ganache shaped like the Evil Queen's heart box. Bake at 160c for 1hour and 10 minutes or until a skewer comes out of the cake clean. Cool the cake on a rack then cut off the top to make a flat top for the box and if needed cut off the ends of the cake to make the box look the right length. Make sure the chocolate is liquid but not hot. 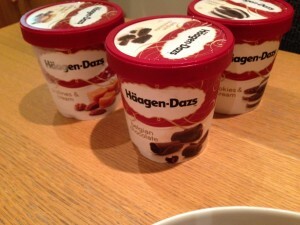 Stir continually and pour in the double cream - the mixture will thicken. Use a palate knife to spread the ganache over the cake. Use flower paste if you have it - it will hold it's shape better than normal fondant. 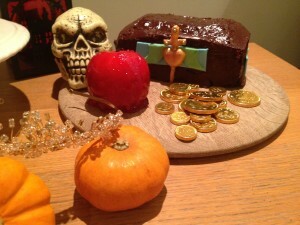 I used a chocolate mould to make the heart shape and made the dagger by hand. blue and green coloured flower paste or fondant make the side panels of the box - a pizza wheel works well to cut the straight edges. Attach to the cake before the ganache sets. 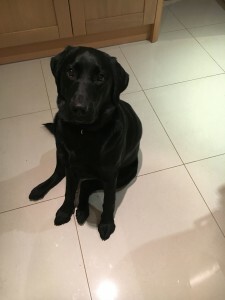 This post is being linked to the great blogger’s bake off final competition kindly hosted by the lovely Jenny Paulin at Mummy Mishaps. She is working with Tesco who are sponsoring the competition and have some fabulous prizes on offer. 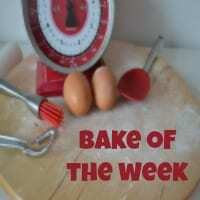 Life has been a bit hectic this year so this is my first week joining in with the Great Bloggers Bake off, I usually try to join in every week but life was winning this year. All though I haven’t been baking I have been watching and I really wanted to try the fondant fancies. I’ve developed a taste for amaretto in hot chocolate recently and I love amaretti biscuits so I thought I would have a go at some amaretto flavoured fondant fancies with chocolate buttercream and mini amaretti biscuits. I used Mary Berry’s easy fondant fancy recipie with a shot of amretto added, then halved Gino D’Acampo’s amaretti biscuit recipe for mini decorative biscuits. I cut the edges from the cake, divided it into 12 pieces and coated it with a chocolate buttercream. I left half of the cakes as buttercream covered and then made a pale yellow fondant to coat the outside f the remaining six cakes. 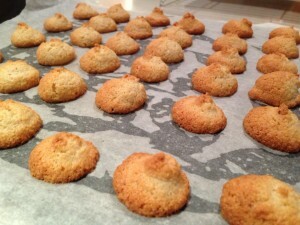 Both types were topped with mini amaretti biscuits. We’ve been in our house now for eight years, and the kitchen has always been good enough, as in there was nothing so wrong with it that justified replacing it. This year though the units began actually falling to pieces and the oven began burning cakes on one side while leaving them underdone on the other, meaning I finally convinced my husband that we should completely refit, with new floor, units, worktops and ovens. I spent a lot of time looking on sites like pintrest and through google image search to decide what kind of style would look good. 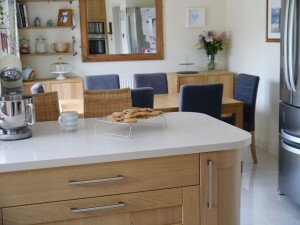 Our table and some free standing cupboards are oak so I knew I wanted wood in the design some how. At first I thought about cream units and wooden work tops but after a bit of research it seemed like wooden worktops would take a lot of maintenance and potentially not be very hygienic, so I decided on wooden cupboards instead. 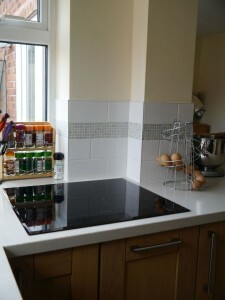 With wooden cupboards I knew I wanted a composite worktop which would be better quality than the cheaper laminates on the market. After considering a high gloss black option I eventually decided on Getacore Ivory Raindrops which is a cream quartz-like effect. This makes the room lighter and brighter and matches perfectly the “Burleigh” (now “Kamber”) high gloss porcelain tiles which we chose. 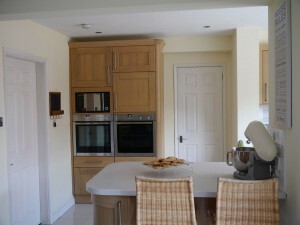 The kitchen is from the Howden’s Tewkesbury Light Oak range with solid wood doors. 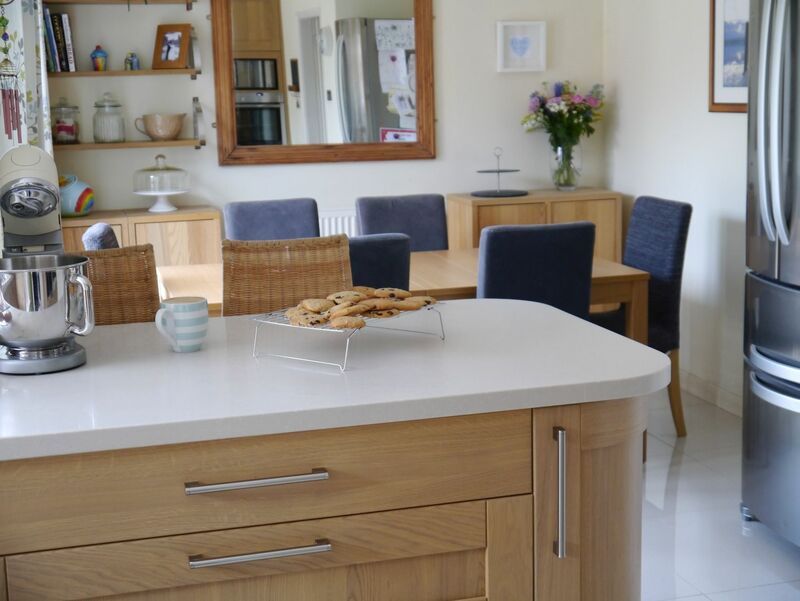 We looked at vinyl wrapped mdf doors similar to our original kitchen but the Teweksbury range was such a beautiful finish that there was – in the end – no comparison. We were also slightly limited by the fact that I knew from the start that I wanted curved cupboards at the end of the breakfast bar and not all ranges offered this. The end result is very sleek and gives us extra storage, although it did mean finding a built in bin of a reasonable size to replace the one we used to have at the end of the breakfast bar for recycling and general waste. The food and general-waste bins are now both hidden in cupboards under the hob and sink, making the kitchen look tidier and also meaning no more opening germ ridden lids to throw something away - we just open the cupboard doors. Ever since we moved into our house I’ve known that if we re-did our kitchen I wanted eye-level ovens built into a tower unit on the wall – originally this space had wall and floor cupboards with some extra worksurface, but being able to see at a glance how the food is doing more than makes up for this. 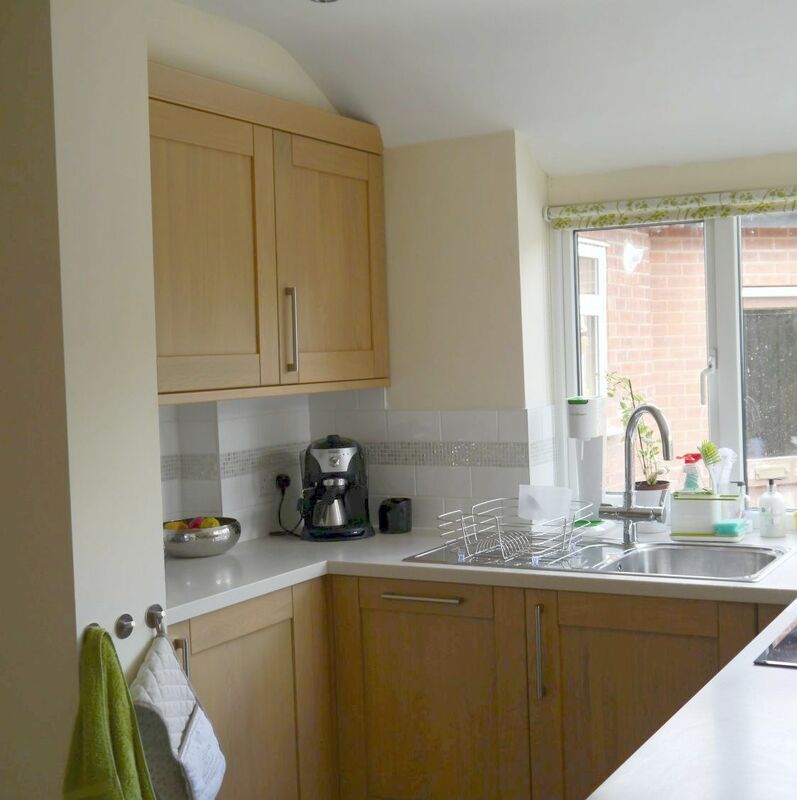 I chose Neff slide ‘n hide ovens so that children running ’round corners have less chance of bumping into open doors and our existing microwave was fitted in above the ovens to clear off the remaining worktop space. We further reduced clutter on our worktops by investing in a Grohe Red Duo tap which produces boiling water and gets rid of the need for a kettle – the only down side I would say to this solution (apart from the price) is that the tank, filter and other attachments needed for the tap take up a lot of space themselves, limiting space under the sink to the point that we ended up with the tank itself in the neighbouring cupboard so that we could still fit our food waste bin under the sink. We chose a Bosch induction hob which can just be wiped clean – a much easier job than with our old gas hob – you just have to check any pans you buy are magnetic – no expensive copper bottomed pans for me! Howden’s is a company which works with independent fitters – it means that rather than going into a shop and designing your kitchen then meeting the person fitting the day they start work, you find your kitchen fitter first then work with them to design what you want. Having heard of lots of problems with store designed kitchens not fitting quite right I liked this idea – we worked with our fitter Pete from IKF Chester Ltd (who was recommended by a friend) from the start, meaning that he saw the layout of the room, understood what I wanted to achieve and worked with us to fit in all the fiddly bits and pieces I wanted. 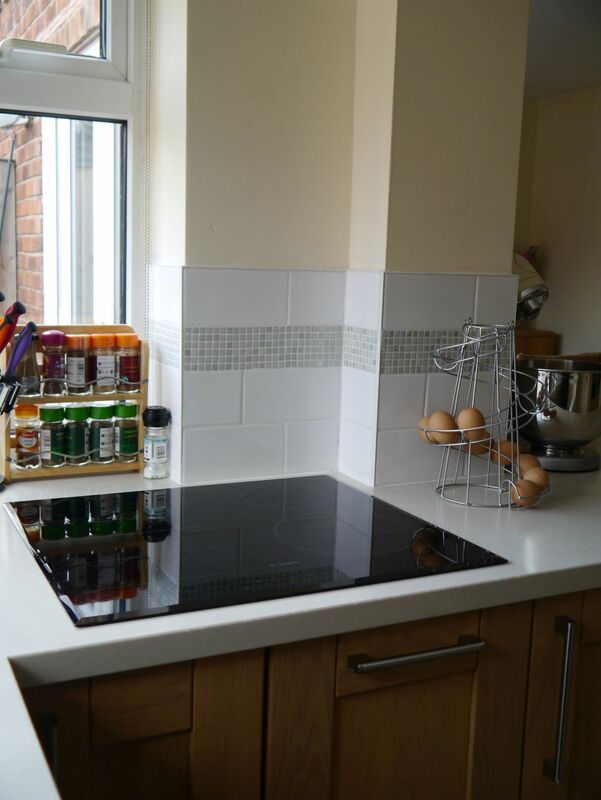 I can highly recommend IKF Chester Ltd. – they worked really hard to get everything just as I wanted it, even when the mosaic tiles I’d chosen as part of the splash-backs arrived and were about half the thickness of the surrounding tiles. 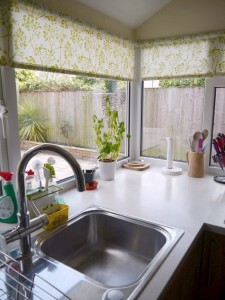 Finally I chose green accents and bought blinds with a “Budding Blossom Grass” design from Web Blinds, some Joseph and Joseph green and cream bits and bobs and used green hand towels which I already had. Overall I think I now have my dream kitchen – what would yours look like? 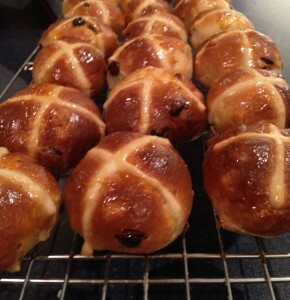 Apparently hot cross buns are supposed to be eaten on good Friday (the end of lent). I’m clearly a rebel because I made them on the Wednesday night and took them to work on the Thursday. 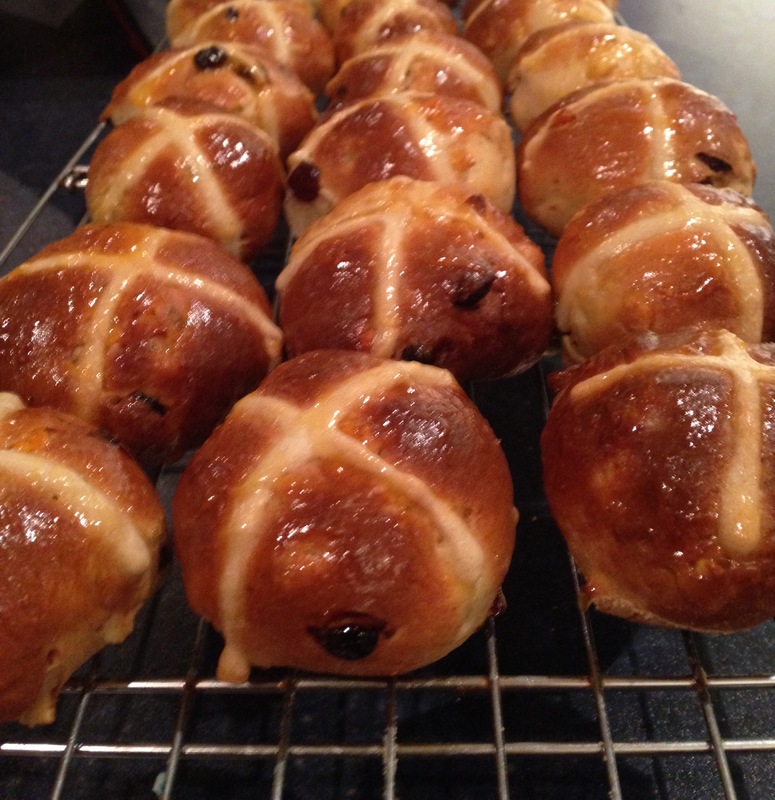 This was my first ever attempt at hot cross buns and I think they look pretty good considering, I combined a couple of recipes I found online to produce my very own version. Once the dough is smooth and elastic cover the bowl with clingfilm and leave to prove for at least an hour until doubled in size. Cover with a tea towel / cling film and leave to prove for at least 30 minutes until doubled in size. Bake for 20 minutes or until golden brown and hollow sounding.